How to Draw Mickey Mouse. Mickey Mouse is a classic cartoon character that you can draw with a few simple lines and shapes. Use the steps below to guide you, and with a little practice and patience, you will have your own drawing of Mickey Mouse. Make a large circle in the middle of your paper. Take your ruler and lightly draw a straight line vertically down the middle of the circle and a straight line horizontally across the middle. This will create your center lines. Add Mickey Mouse's eyes by drawing tall ovals on the top inside corners of your center line. Put smaller ovals on the bottom of each to make his eyeballs. Draw one long upward curved line that goes under both of his eyes. Create his nose by drawing a long oval below the center line and in the middle of your vertical line. Draw a long downward curved line under his nose to make the top of his mouth and add small upward curved lines on each end. Next make the bottom of his mouth by drawing a smaller downward curve that connects to the long one you created. Attach a chin by adding a small downward curve to the bottom center of the original circle. Make his ears by adding two big circles on the top outside of his face. Start on the left side of the horizontal line, in line with the end of his mouth. Then make a large M-shaped curved line that goes around the two eyes and stops on the right side of the horizontal line. Finish his face by bringing the ends of the "M" out with a curve and down under his mouth. Erase the center line and your Mickey Mouse is complete. 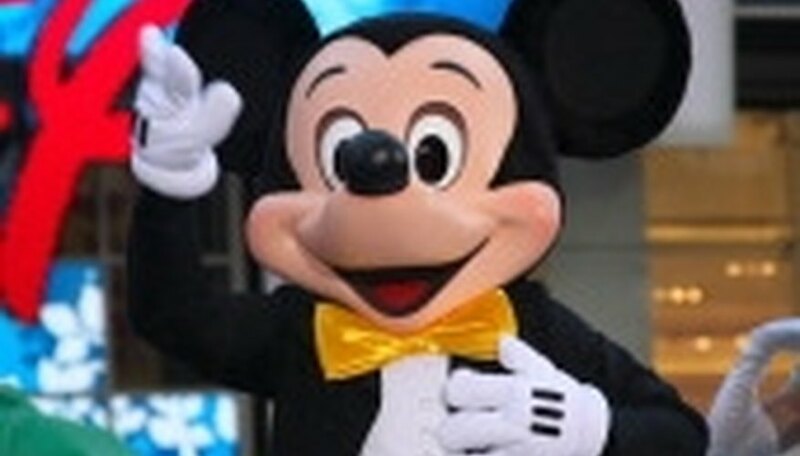 Keep a picture of Mickey Mouse on hand to help you with the correct placement of his features.